For centuries, the requiem mass has been the most eloquent and intense means of prayer for the departed. The offering of the sacrifice of the Eucharist as a means of intercession has been the inspiration for the most sublime music. In the mass, earthly grief is assumed in the worship of heaven. In the sign of the raising of Lazarus in the eleventh chapter of St. John’s Gospel, Jesus is seen encountering the raw and angry grief of Martha and Mary, and is moved to tears at Lazarus’s grave. Jesus, who declares himself ‘The Resurrection and the Life’, is both the victim of death’s pain and a victor over its power to separate and diminish humanity. In all this, he prefigures the events of Easter. In the Lazarus Requiem, the mystery of life and death, the pain of grief and the hope of a risen life are held in taut symmetry. The experience of death and dying, the challenge of faith and the promise of hope are all present. These are words and music for any person who has wondered in the face of death. There are many variations of the Propers for a requiem, and composers have used various configurations to serve their own creative ends. The text of the Lazarus Requiem follows that used by Fauré very closely—except at the very end where the traditional reference to Dives and Lazarus has been omitted (as this refers to a different Lazarus.) Fauré’s Requiem selects all the texts that point to heaven and the hope of the resurrection. 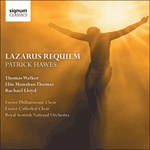 In the same way, the Lazarus Requiem emphasises the victory of Christ over death, but does not evade the pain and confusion that death leaves in its wake. The eleventh chapter of St. John’s Gospel figures heavily in the funeral rites of the reformed tradition, stressing the need for the personal recognition of Jesus as ‘the resurrection and the life’. In this way, the Lazarus Requiem opens up a truly catholic perspective on the Christian experience of death and dying. There are various examples of the liturgical sequence of the requiem being used as a framework to carry other texts: Britten’s War Requiem is one English example. In the Lazarus Requiem the text, with the exception of one original poem, is from the New Testament. In this way, the liturgical text and the scripture throw light upon one another and so illuminate the hearts and minds of all those who perform and listen in a ‘double light’. It is possible both to extract the Latin texts and use them as a liturgical setting, or to extract the narrative of the Gospel and perform a dramatic cantata. Many of the ‘movements’ also stand alone for concert or liturgical performance. The work begins with an orchestral Elegy for Lazarus which depicts the dying man and sets the scene for the first tableau. The sound worlds of the tableaux and the Latin movements are quite different. The Requiem aeternam, Kyrie, Sanctus etc. 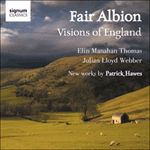 use the full resources of both choir and orchestra whereas the tableaux, as well as using semi-chorus, are characterised by muted strings, harp and baritone saxophone. Christ’s solos see the addition of the four horns. There are moments when the two sound worlds become superimposed. Most notably, the Benedictus takes the form of a soprano solo sung by Mary and, at the climax of the miracle when Christ exclaims, “Unbind him! Loose him! Let him go!” the mutes are removed from the strings, and the full orchestra interject with the concluding section of this tableau. The final movement of the work is the Lux aeterna, for choir and orchestra, together with the two female soloists. the brother of Martha and Mary. and unto thee a vow shall be repaid in Jerusalem. and unto thee shall a vow be given in Jerusalem. Fac eas, Domine, de morte transire ad vitam. Quam olim Abrahae promisisti et semini eius. ne cadant in obscurum. Amen. nor let them fall into darkness. As once you promised to Abraham and his seed. nor let them fall into darkness. Amen. Christ: Eyes, come and see the hard, cold stone of death. See, and then know the loss and fear in grief. And see prefigured there Golgotha’s hill. Pity that flows from Love’s desire to share. Love pity me who Death for love will bear. Death’s sure decay is near. The gift of hope; the warm touch of His breath. Semi-Chorus: Jesus, deeply moved came to the tomb. Martha: ‘Lord, there will be a stench. Christ: ‘Father, I thank thee that thou hearest me. Semi-Chorus: The dead man came out bound in grave clothes. With thy saints for ever, for Thou art merciful.